The polyurethane in Ground Control Horseshoes (the stuff skateboard wheels are made of) improves traction and increases shock absorption. They are useful for trail riding, endurance riding, driving, jumping, breeding, showing, mounted patrol, parades, and more. Relieving stress on tendons and joints is beneficial for your horse. If you use Borium or carbide tipped nails, they eliminate the slip, but what about the shock? Metal sends shock directly to the tendons and joints. So why do people put metal on their horses? Try jogging down the road in your ice skates or golf shoes. With Ground Control Horseshoes, shock is substantially reduced, giving you and your horse the freedom to hit the road running. From hard packed trails, to blacktop roads, to concrete barn floors, Ground Control Horseshoes give your horse the confidence he needs to take you to that next step. And, with its flexible characteristics, you’ll never have to replace that metal shoe your horse bent while pawing. • The rolled toe design eases break-over and provides improved movement. • A recessed nail channel provides multiple nailing options, yet keeps the nail from contacting the ground. • A recessed frog support protects the soft tissue from sharp rocks and stimulates the frog on impact, increasing circulation and improving the horse’s endurance. 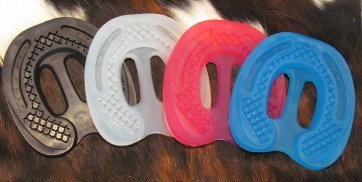 • The open areas allow the sole to breathe while also providing easy access for cleaning with a hoof pick. Surface condition, speed of the horse, wearing pattern, and number of miles traveled are all variables in the length of time that the shoes can be worn. Most users will reset after 5 or 6 weeks and use the same shoes for a second shoeing period for a total of 12 weeks. 1. Trim the hoof, making sure you have a flat balanced surface. Rasp around the hoof, making the edges smooth like a final trim. File any flares, dry or cracked areas. The frog should be trimmed level with the hoof wall so that it will be flat against the shoe’s center hoof protector. 2. File the horse’s toe area, matching the angle on the Ground Control Shoes. This will help with the rollover motion of the hoof - like a natural balance trim. 3. Start with the correct size shoe. Place it over the hoof and make sure that the nail channel matches the white line of the hoof. A little of the shoe should stick out arround the edges. Use a sharpie marker to mark the white line if it makes it easier to see through the shoe. Clear and trans-parent pink shoes are easier to apply since you can see through them. 4. Hammer the first nail into the shoe at the outside of the white line. Repeat on the other side, then hammer in the other nails. Make sure that the nail head is down into the nail channel. Use a nail set or bang hard on the last hit. Four nails per side hold best. You can nail anywhere within the nail channel - the divets are suggested placement areas only. 5. Put the hoof on a hoof jack and cut the excess urthane off with hoof nippers at the back and rasp the edges along the nail channel at the side. Leave a little extra (1/8” - 1/4”) urethane around the edges to allow for hoof expansion. Don’t cut too close to the nail channel - extra urethane is needed there for support. 6. Use clinchers to clamp down nail ends. Make sure they are tight, but not so much that the nail heads pull through the plastic.